Traditionally known as the first professional woman writer in English, Aphra Behn has now emerged as one of the major figures of the Restoration. She provided more plays for the stage than any other author and greatly influenced the development of the novel with her ground-breaking fiction, especially Love-Letters between a Nobleman and his Sister and Oroonoko, the first English novel set in America. 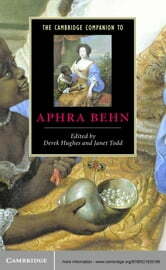 Behn's work straddles the genres: beside drama and fiction, she also excelled in poetry and she made several important translations from French libertine and scientific works. This Companion discusses and introduces her writings in all these fields and provides the critical tools with which to judge their aesthetic and historical importance. It also includes a full bibliography, a detailed chronology and a description of the known facts of her life. The Companion will be an essential tool for the study of this increasingly important writer and thinker.